Video games have been a prominent part of the home entertainment scene for decades now. Before their creation, the world was enamored with a different type of pastime: board games. Though they’ve been entertaining the masses since ancient times, the modern age has given us numerous types of board games spanning across a variety of different genres. The medium has grown so large that many retail stores have sections dedicated to the craft, and some tabletop adventures are so elaborate that they make use of purchasable expansion packs and paintable figurines. Unfortunately, some board games can come at a hefty cost, and it can be pretty taxing to shell out cash for each and every adventure you want to collect. Thankfully, one developer has presented board game enthusiasts with a rather cost-effective way to enjoy their favorite games. Tabletop Simulator is everything you could ever want in a board game. In fact, it’s anything you could ever want it to be. The word simulator usually refers to the “realistic imitation” of a complex system. When people think about making use of a simulation, it’s for training purposes, or to pass the time enjoying a realistic ride through something they can’t possibly experience in real life. Simulation, in this sense, is giving tabletop gamers a literal playground of board game goodness to sift through. When you first open Tabletop Simulator, you’re greeted with a decent array of common board games. Here you’ll find things like chess, checkers, Chinese checkers, go, backgammon, cards, and even jigsaw puzzles. Unfortunately, Tabletop Simulator doesn’t have any A.I. built into it, so you won’t be able to play any of these games against a PC opponent. That being said, it’s incredibly simple to join or create a server. In no time you’ll be communicating with like-minded players from all over the globe. You can instantly “summon” any of the classic games you wish to, and most of them come complete with detailed rules if you’re unfamiliar with how to play. I had a lot of fun challenging strangers to chess. What made it even more entertaining was the fact that, as host, I could change the color and material of the pieces. Pieces could also be resized, and the game came complete with its own “physics.” Pieces will fall over if dropped too hard and there were many instances in which one of us would accidentally fling an errant knight off the table. 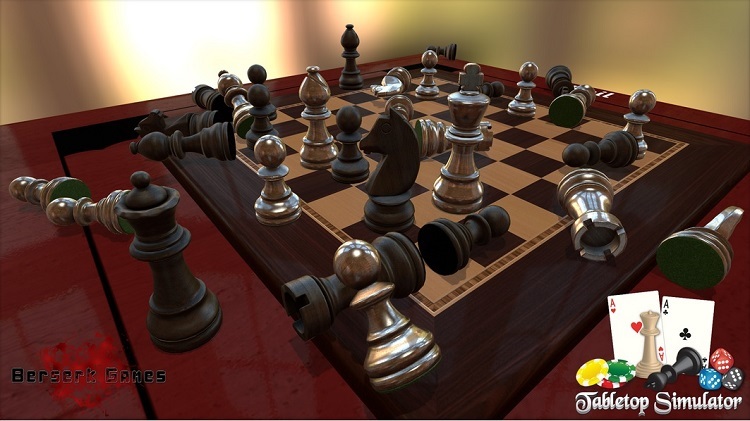 I won’t lie, there were many moments in which things became completely chaotic, as chess moved aside for general play. We would sometimes spend time flicking pieces at our virtual selves, or create giant “mega pieces” by scaling them larger than the table itself. What’s even more entertaining is the fact that those of us who lose ourselves to emotions during a heated game can actually flip the table. Don’t worry though, the host has the ability to “rewind time” so that all of the pieces are recalled from the void. If you find yourself with a troublesome table-flipping annoyance, you can simply boot them from your room. Thanks to Steam integration, it’s super easy to join friends, and with password locks you can keep your game sessions private. The ability to play these classic games easily online, and the beautiful graphical elements for Tabletop Simulator, are probably enough to warrant the low $20 price tag. However, where Tabletop Simulator truly shines is the massive Steam Workshop support it comes packaged with. Players from all over the world have been steadily supplying the community with mods since Tabletop Simulator first released. At the time of writing this article, the game already features over 12,000 items to download. In the workshop you’ll find things like custom dice, character models, game pieces, game boards, and even entire game creations. The community at large has welcomed Tabletop Simulator with open arms, and this has sparked a firestorm of creativity which has spread quickly across Steam. Tabletop Simulator may have started as a simple stable of classic board games, but it’s blown up into a wonderland for anything you could ever want. Battleship, Monopoly, Cards Against Humanity, The Game of Life — all of it and so much more is just a download away. You can even find brand-new board game additions, like Exploding Kittens, Joking Hazard, Secret Hitler, and many more. This is all made even more amazing by the fact that you can login and jump into one of thousands of rooms hosting these games. Anyone who enjoys board games can tell you that it can sometimes be a headache to find people to play with. 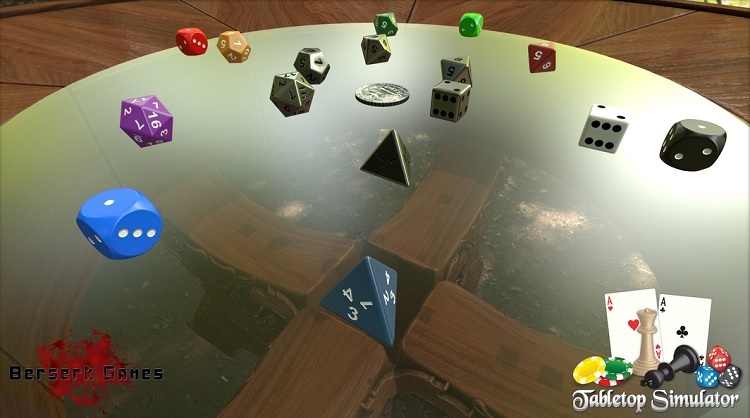 With Tabletop Simulator, you’ll never have to worry about finding players again. If you fancy yourself the creative type, you can try your hand at creating your own content. I messed around with the editors a little by crafting a Guild Wars 2 themed playing card deck. The deck editing tool located in the Tabletop Simulator folder was easy to use, and with a little fiddling in Photoshop, I had a custom deck in no time flat. If you’re more comfortable manipulating 3D models, you can use Blender or any other applicable modeling application to craft boards, tables, random objects, dice, character pieces, or anything else your heart desires. There are few limitations to what you can crank out for Tabletop Simulator. 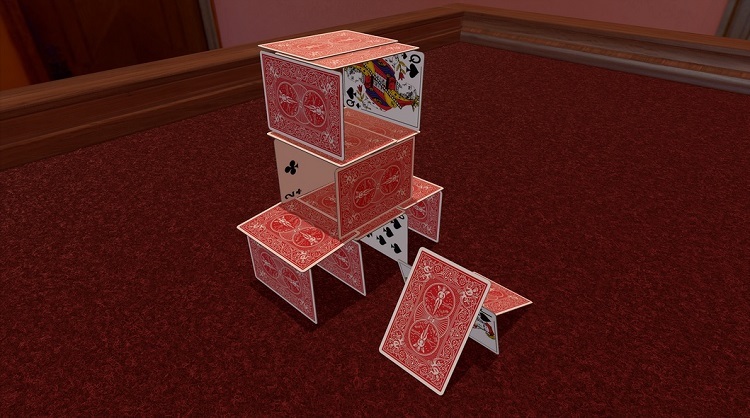 Some individuals have even taken to scanning game boards and playing cards to create games that are as close as possible to their real-world counterparts. There are even fictional games to be played, like the hilarious Eels and Escalators title from Spongebob Squarepants. I was amazed by how much you can really customize within Tabletop Simulator. You’ll be able to craft a room with a custom immersive background and custom table. If you feel like playing cards in a dark alleyway with a cardboard table and fake rats, you can do just that. Maybe you prefer to play poker near the Vegas Strip. Whatever you want, you can create, which gives Tabletop Simulator an immense amount of value and replayability. 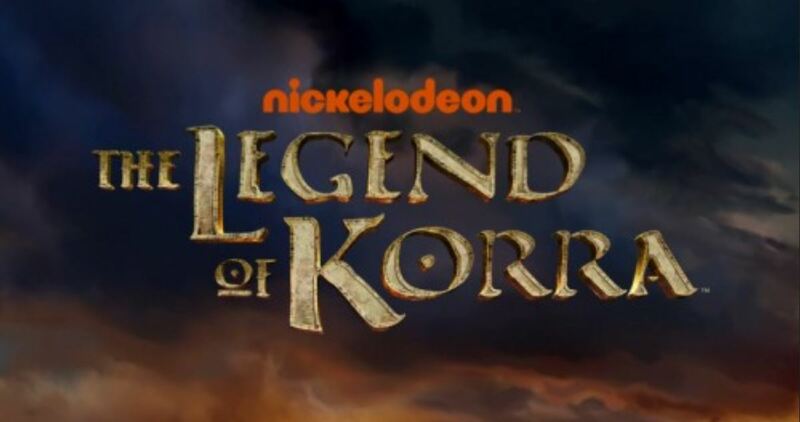 This title is even complex enough to feature a fully functional tablet, which you can summon whenever you like. You can spawn as many of these tablets as needed, and use them to access the internet, check game rules, browse Youtube, or anything else you want. This adds an entirely new layer of functionality to an already impressively in-depth release. If you’re a fan of board games then Tabletop Simulator is a must have. The $20 price tag is simply too low for what this release really has to offer. I love the physicality of a tangible product just as much as the next person, but Tabletop Simulator opens doors to play some of my favorite games with people from all over the planet. Better yet, I’ve been using this game to “pick and choose” what board games I might want to purchase in the real world. Tabletop Simulator is one of the most entertaining things I have played in a long time, and I simply can’t recommend it enough. 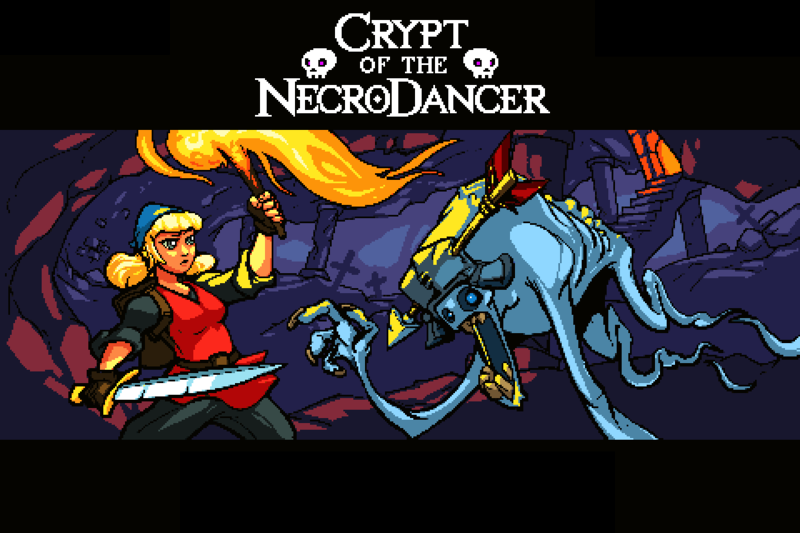 You can grab this release right now on Steam, The Humble Store, and Green Man Gaming. If you’re interested in getting more information about this release, as well as any applicable DLC, be sure to check out the dedicated website here.